Two fanedits and a collection of material related to the making of the Star Wars Bounty Hunter videogame. see Changes tab. This is a 3-disc set. Galactus captured footage from the game, and MoveAlong edited it together to create a full-length movie. This cut preserves the game's widescreen cut scenes and full screen gameplay footage in their original aspect ratios. Health and weapon indicators are visible onscreen, for a "purist" experience, like you're watching someone playing the game. For this alternate version of the movie, ThrowgnCpr reformatted all the gameplay footage of the original edit to a widescreen aspect ratio for a more "cinematic" experience. Some scenes were trimmed slightly, new transitions were added between scenes, and gameplay footage was cropped and color corrected. Images and biographies of eleven characters from the game. The briefings shown onscreen before each of the game's eighteen chapters. The DVD-ROM portion of the third disc includes over 9,900 files. It includes audio and video clips, images, magazine articles, interviews, game reviews, and much, more more. The "audio" portion includes every clip of music, dialogue, ambient sounds, and sound effects heard in the game. The audio to the game's cinematic cut scenes is included in six different languages. The "images" folder contains tons of concept and promotional art, and also includes a folder with over 1000 texture maps used in the game. The DVD-ROM is the definitive archive of "Star Wars: Bounty Hunter" material. 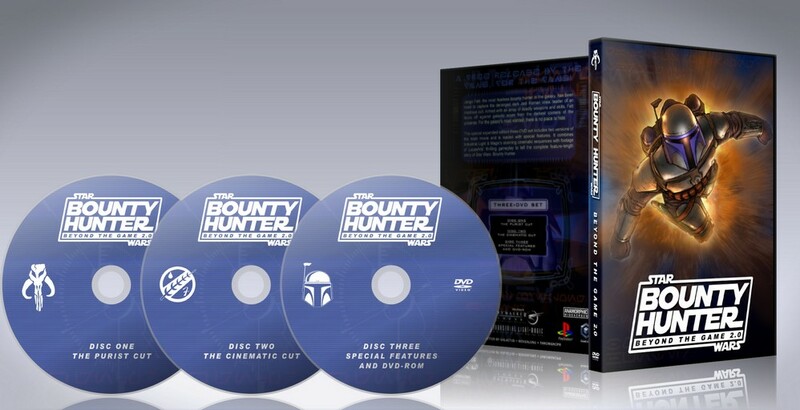 "Star Wars: Bounty Hunter" was released in 2002 for the Sony PlayStation 2 and Nintendo GameCube video game consoles. MoveAlong and I collaborated on a DVD titled "Star Wars: Bounty Hunter - Beyond The Game," which was released in October 2006, and you can read the original thread at originaltrilogy.com HERE. That release essentially compiled all the cinematic cut scenes from the game created by Industrial Light & Magic, several Special Features, and a DVD-ROM folder of various files. Unfortunately, the cut scenes alone did not tell the entire the story of the game, and watching them compiled together could prove to be a bit confusing. I honestly believe the game tells one of the most compelling stories of the Star Wars universe outside of the movies, and is closer in tone to the original trilogy than to the prequels. It takes place ten years before the events of Episode II. It begins with Darth Sidious summoning his apprentice, Count Dooku, and assigning him two tasks. The first is to eliminate Komari Vosa, a deranged former Jedi, and leader of the mysterious and deadly Bando Gora cult, who Sidious sees as a threat to his plans for the future. The second task is to find a source for his planned clone army. Dooku suggests they accomplish both tasks with one stroke. He will place a huge bounty on Vosa, and the hunter who is resourceful enough to deliver her would make a good source for the clone army. Although its a dangerous proposition, Jango Fett decides to pursue Vosa since the bounty is so large. Also after her is Montross, a Mandalorian turned bounty hunter like Jango, who is now his bloodthirsty rival. The story also introduces Zam Wesell, and tells how Jango obtained his ship, Slave I. In early 2007, I began capturing gameplay footage, and compiling more material for the Special Features section of the DVD. The goal was to assemble a fulll-length movie, combining ILM's pre-rendered cinematic cut scenes from the first release, cut scenes from the actual game engine, and gameplay footage, so that the complete story of "Star Wars: Bounty Hunter" could be told. MoveAlong originally partnered with me on this 2.0 release, but he had to drop out due to other commitments. ThrowgnCpr offered to collaborate with me to complete the project. Galactus assembled and organized all the material for this collection, and MoveAlong edited the movie on the first disc. ThrowgnCpr edited the movie on the second disc, and he took on the MASSIVE job of authoring all three DVD's (and designed our DVD cover). I'm very grateful to both MoveAlong and ThrowgnCpr for collaborating with me on this project (that was almost seven years in the making). Thanks for your interest! 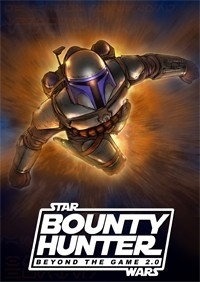 A great idea, turning the bounty hunter game into a full length movie. I came in here for the story, and boy was it great. A nice backstory for Jango Fett, that we never knew much of in Ep. 2. I chose the Cinematic cut for this one, and I liked how it worked as one movie. But I think there could be maybe around 5 to 15 more minutes cut, but it still works fine. Some transitions worked, some didn't for me. The music is fine I think, the fades from the cutscenes can be noticeable sometimes, but wasn't too distracting. Overall though, I can feel the work and love that was put into this. I liked this idea, and certainly pretty well executed. A great flick to be certain. A truly inspired concept, as well as a labour of love, from Galactus with generous assistance from MoveAlong and ThrowgnCpr. The intention was to edit footage from the game, Star Wars: Bounty Hunter, as well as deleted scenes, into a full length movie. Video - I opted for the Purist Cut. Image quality varied at times, but was never less than very good. Most scene changes were terse fade out / fade in type. Not a complaint, but it was noticeable. Audio - Dialogue clear throughout, though I often had to boost the volume during conversations, ease back down during gunplay. As with the Video, some of the crossfades are quite brief. No subs, none expected. Narrative - As noted by Galactus, there is an excellent Star Wars backstory here. This was set ten years before Star Wars E02. If true, then Count Dooku had only recently left the Jedi order, after Qui-Gon Jinn was killed. Jango's story by itself was enjoyable - a huge bounty offered by Lord Tyranus for the liquidation of Komari Vosa, ex-Jedi. For Fett, Vosa would be a grudge hunt. Enjoyment - Yes, great little story in this. To my thinking, however, a mistake was committed in trying to extend this into feature length. The film runs at least 20 minutes too long. Sequence after sequence of Jango endlessly running could have been chopped. Repetitious and wearisome. Mind you, this is the opinion of a D- game player. I never made it to the end as Galactus did. That sums up my thoughts. I enjoyed the creative work, the illuminating plot points about Jango Fett and Montross, and most - to a point - of the action. This is, at best, a B-film and should have been trimmed to roughly 80 minutes. Nevertheless, a welcome addition for Star Wars fans. I never played Bounty Hunter but I’m a big fan of watching others play video games, so this was right up my alley. Turns out this was a nice little game. I’m glad they went through the work to make this fanedit. And man what a package, 2 cuts of the edit (I preferred Purist) and an asston of bonuses. And ThrowgnCpr continues to impress me with his boss menus.